Schools can be a melting pot for cultures and languages—many are multicultural havens where languages, practices, and beliefs come together and build a more unified world. Schools are able to use education and tolerance as a way to strengthen their cultural identities and promote inclusion through interaction. In the 21st century we have the means to increase our interactions and improve the quality of our communications with the use of technology. Technology has heralded an age in which everyone has access to education. It doesn’t matter what your nationality is, you still have the ability to learn—whether you’re a student learning something new or a teacher trying to improve the quality of the classes they teach. 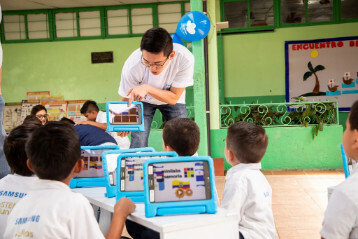 Technology helps to close gaps in learning and reduces intolerance as people become more exposed to other cultures. It also encourages the whole world to be more curious and open. 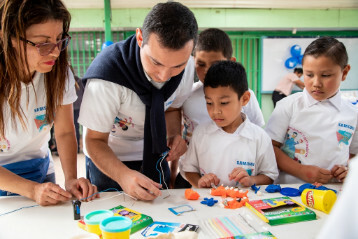 Inspired by this, SELA (Samsung Electronics Latinoamerica Miami) employees organized an event that would celebrate Samsung’s 2018 Global Volunteer Festival. To promote cultural harmony and inclusion among public schools, they formed an initiative called “eSTEMos Juntos” (Let’s be together! ), which would teach children and youths how to incorporate STEM (Science, Technology, Engineering and Math) in their day-to-day lives. 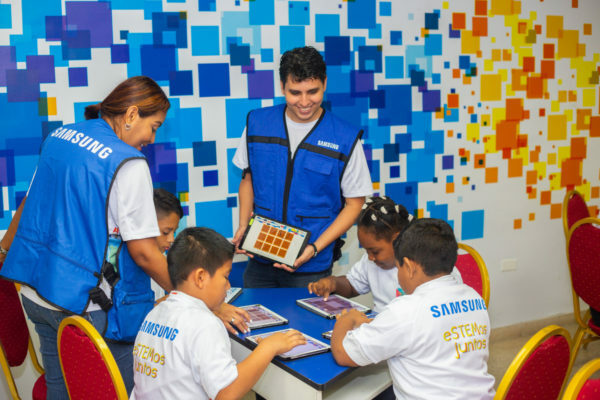 Volunteers equipped with Samsung Galaxy tablets and STEM interactive educational tools were positioned at four stations in each participating school. 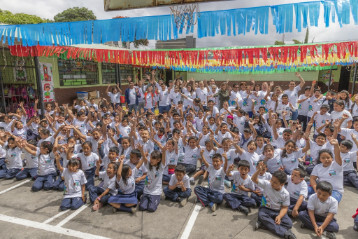 At each station the children would engage in fun and dynamic activities to learn about the cultural diversity of Latin America and the importance of inclusion. 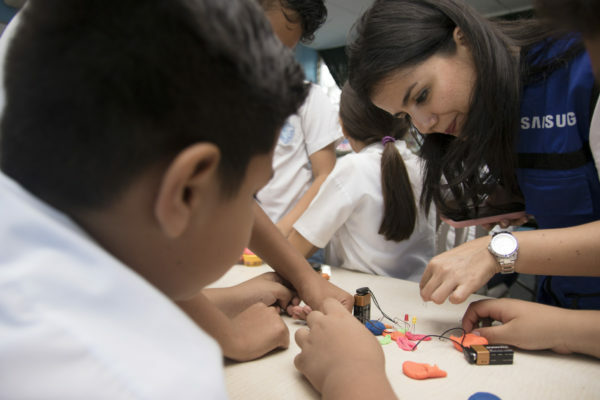 SELA volunteers in Ecuador, Dominican Republic, Panama, Honduras, Guatemala, Nicaragua, El Salvador, and Costa Rica conducted educational and interactive MiniLabs, which instructed and engaged around 700 youths from public schools in disadvantaged areas. 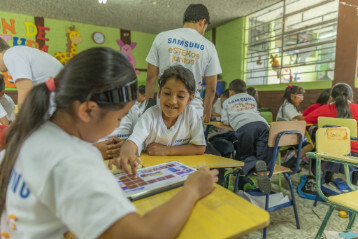 This event was carried out with the support of the international non-profit organization, Plan International, which is a strategic and operational partner of Samsung’s corporate citizenship programs in SELA. It was also part of the annual Samsung Global Volunteer Festival held in October, a broader approach for Samsung employees to positively impact communities around them. In one part of the program, there was a station for Rich Musical Rhythms, which gave students the opportunity to explore the musical rhythms of different regions. 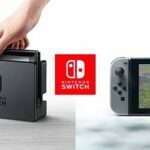 It also encouraged the children to compose music using a combination of traditional instruments and the digital instruments available on Samsung tablets. There was another station for History and Geography, which consisted of a memory game using an app designed for the activity. This allowed children to test their knowledge about the diversity of geographical sites and learn about the rich cultural pasts of different countries. The third station was set up for Traditional Games, which encouraged the children to play games from other nationalities and regions. Volunteers and students would select a traditional game from their country to play and have some fun. Then, they would explain how to play the game by creating a short video with the tablets. The idea was to share all of these games with students who were also participating in “eSTEMos Juntos” in other countries. The final station was Electrical Circuit Creation. This station was dedicated to teaching students one of the fundamental principles of technology—how electricity works. Students learned about the seemingly magical world of electricity and how to create electrical circuits with clay and cables. Volunteers taught children how to set up simple electrical circuits, short circuits, parallel circuits, and series circuits. They also assured the children that they could be part of the technology industry regardless of their background—all they had to do was learn. The day ended in high spirits and there was a small celebration for the children and volunteers.